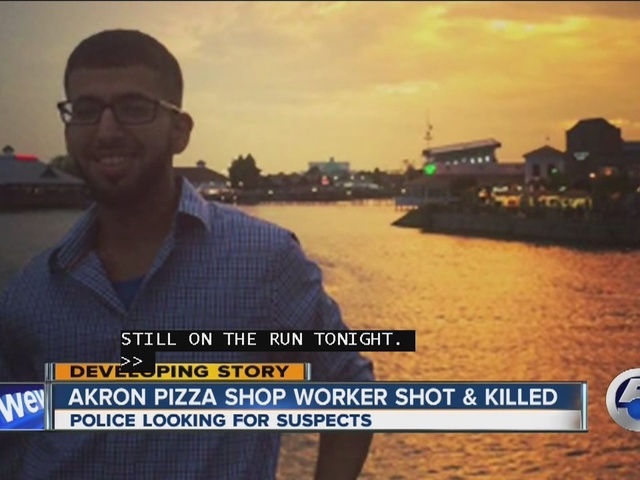 Twenty-four hours after an Akron college student’s murder during a robbery inside a pizza shop, police are still searching for the killer. Zak Husein, 21, was closing up the pizza shop run by his brother on Glenwood and Patterson Ave. in Akron just before 11 p.m. Monday night when a masked gunman walked in, demanded cash, immediately got it — and shot Husein in the chest anyway. “He looked at me for a second, I put my hands up, put them back down,” said a witness and fellow pizza shop employee who asked to remain anonymous for his safety. The employee called 911 after the killer ran into the darkness and Husein faded out of consciousness. He later died. "If you can find somebody with a better heart, you let me know," said Ammar Husein, his brother. "He had a beautiful soul, that was him," Husein's sister added. Husein’s family is now offering a $50,000 reward for the arrest and conviction of the murderer. He will be laid to rest on Wednesday. Akron Police believe the gunman may be linked to robberies at two Family Dollar’s over the weekend where a clerk was pistol-whipped. Anyone with information should immediately call police.